Tough week for BYB in NFL betting tips last week as we hit on just one of four tips, missing another by just 0.5 points. No Thursday night game in Week 16 but there is two Saturday games (Sunday AEDT) to look forward to as well as a fantastic 13 game Sunday slate. Massive AFC clash on Sunday afternoon between the Ravens and Chargers as Los Angeles look to pull one game clear of the Kansas City Chiefs in the AFC West division. After a brilliant win against the Chiefs on the weekend, the Chargers drew level with them at 11-3 on the season and can take the lead in the division before Kansas City play on Sunday. The Ravens captured a great win over the Buccaneers in Week 15, making it three wins from their last four games and they currently sit just half a game behind the AFC North leaders, the Pittsburgh Steelers. The Ravens defence has been one of the best in the league in 2018 so far, allowing the fewest points per game at just 18.1 and sitting in the top three in both passing and rushing yards allowed. With fantastic away wins against the Chiefs and Steelers in the last three weeks, the Chargers are looking like arguably the most complete outfit in the league. They have finally combined a solid defence with their dynamic offence led by Philip Rivers. Star running back Melvin Gordon also looks set to return for the Chargers this weekend and with the Chargers back at home, we cant see them dropping this one. The Steelers kept their season alive with a hard-fought win over the New England Patriots at home in Week 15. Pittsburgh managed just 17 points in the win but it proved to be enough as they held Tom Brady and the Patriots to just 10 points. The Steelers run game was fantastic in the win as they racked up 158 rushing yards and 6.3 yards per attempt. The New Orleans Saints went into Week 15 with a fairly relaxed approach after having already sealed their division. They weren't at their offensive best in the Monday night game against the Panthers but still came away with an important three-point home win to send them one game clear of the Rams for the No.1 seed in the NFC. The Saints will finally be back at home this weekend after three tough games on the road in a row. They are 5-1 at home straight up and 4-2 against the spread at home. We think they cover here against a Steelers team that ultimately wasn’t fantastic on the weekend against the Patriots. The Seahawks had a great chance to secure a wildcard spot in Week 15, but couldn’t get past the San Francisco 49ers away from home. They still sit one game clear in the wildcard spot, but will likely need to win at least one of their two remaining games to secure it. The Seahawks loss in Week 15 was their first in five games and with two home games against the Chiefs and Cardinals to come, they’ll fancy their chances of making the playoffs. The Chiefs lost just their third game of the season in Week 15, going down to the Chargers in a thriller. They’ll be back on the road this weekend before returning home for a Week 17 clash against the Raiders. The Chiefs will be desperate to win their remaining two games as a loss will likely see them surrender the top seed in the AFC and fall all the way to a wildcard position. Really tough game to call here. The Seahawks have been one of the more impressive teams over the past month but the loss to the 49ers leaves a bad taste in the mouth. The Chiefs have a fantastic 5-1-1 record against the spread away from home and just a 3-4 record against the spread at home. We think they bounce back from a touch loss against the Chargers this weekend. While neither team is in the playoff hunt, the Monday night clash between the Oakland Raiders and Denver Broncos should be an interesting one. After an horrendous start to the season, the Raiders have finally started to find some form under new coach John Gruden, having taken the Chiefs to the final play in Week 13 and winning two of their last five games. The Broncos have a 6-8 record on the season so far and while they have boasted some impressive wins over the likes of the Chargers and Steelers, they have had some terrible losses as well, especially over the last few weeks to San Francisco and Cleveland. The Raiders start as home underdogs here, which we think is a little strange given the turnaround they’ve had over the last month or so. We like them to cover at home. The best Australian sportsbooks are providing a great range of NFL betting promotions this season. Take full advantage of these promos while they are on offer to give you the best chance of a profitable season! BetEasy are the largest sportsbook in Australia and offer a huge range of sports betting markets. It doesn't matter how obscure the sport, BetEasy have your markets covered! They also have some of the best promotions around, including some amazing offers for the new NFL season! Sign up to BetEasy through the links here on Before You Bet and you'll also be eligible for an exclusive first deposit bonus of up to $400! But hurry, as this offer is available for a limited time only! Click here to join BetEasy today! 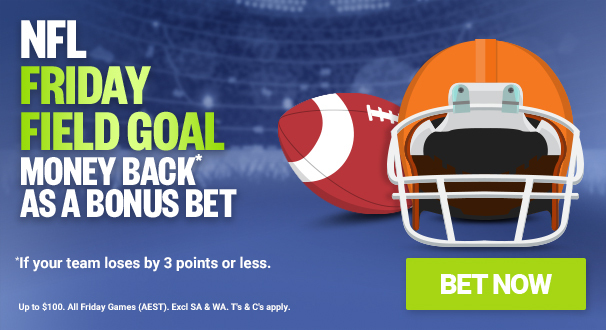 Place a head to head bet on the NFL in any Friday game this season and if your selection loses by 3 points or less, get your money back in bonus bets up to $100! Palmerbet also offer a fantastic $500 first deposit bonus when creating a new account!